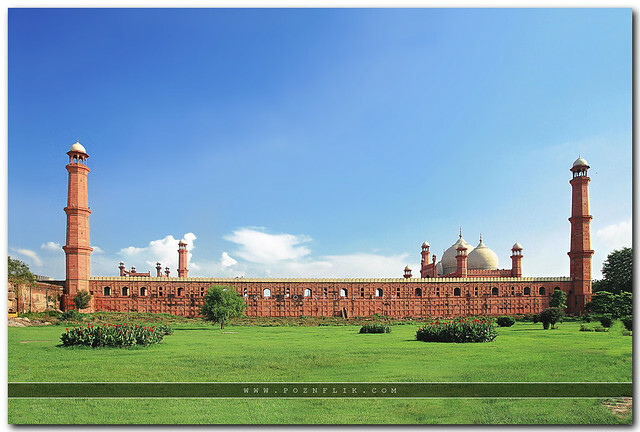 Badshahi-Mosque | Flickr - Photo Sharing! Aamir Yunus, Danial Shah, and 29 other people added this photo to their favorites. What a lovely capture there, my friend, thank you, for sharing! Its true that we got awesome day. We were traveling in Chingchi and M. Asif was not feeling well but these clouds and sky forced us to hit the road in the middle of our journey...... thx to Asif for his word "chalo utarain"
Hi oey....... dilkash colors, dilchasp subject, dilawaaz frame.. dil dil Pakistan. Fantastic Shot....very nice colors and brillient composition. Bht Aala janab. i tried to captrue whole mosque with T33 but its not possible for me. Lahore and this much bright blue sky, unbelieveable. Now thats a angle I dont see much of. very well composed, I agry with Farrukh, about the saturation. you have some amazing photographs Imran saheb. rich and clean shot,so vivid,must have taken after rain lastday. Hi, I'm an admin for a group called My Pakistan, and we'd love to have this added to the group! Hi, I'm an admin for a group called Lahore Exclusively, and we'd love to have this added to the group! Imran Sahab, mere paas alfaaz nahi is photo ki shaan mein kenhe ke liye...excellent composition..beautiful light..lovely sky..no distortion at all..just perfect! How could you be so lucky! !